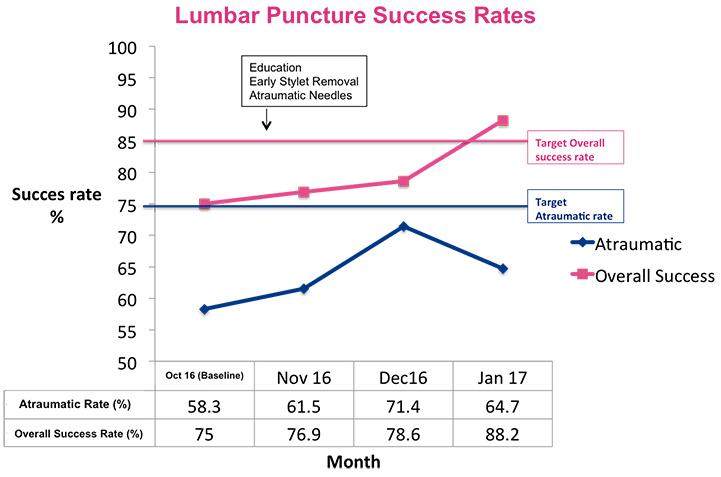 The Children’s Hospital at Westmead (CHW) developed and implemented an interdisciplinary lumbar puncture teaching package for Junior Medical Officers (JMOs) and nursing staff. The simulation-based teaching covered early stylet removal techniques, patient positioning, needle positioning, troubleshooting and analgesia. To increase the atraumatic lumbar puncture rate (1000 red blood cells per mm3 or less) to 75% in febrile infants three months old or less who present to the CHW. To increase the overall lumbar puncture success rate (where cerebrospinal fluid [CSF] is obtained and suitable for cell count, including traumatic and atraumatic taps) to 85% in febrile infants three months old or less who present to the CHW. Reduces the rate of failed lumbar punctures in infants aged three months or less. Reduces diagnostic uncertainty in pathology results from lumbar punctures. Reduces the distress of patients and their families or carers from multiple lumbar puncture attempts. Improves lumbar puncture knowledge and skills among JMOs and nursing staff. Empowers senior medical trainees and nursing staff to teach clinical skills. In November 2015, an increased number of lumbar punctures were performed during an enterovirus outbreak. This highlighted the failure rate of neonatal lumbar punctures at the CHW, which was 22% compared to 5% in similar published settings1. Failed lumbar punctures can result in prolonged antibiotic therapy and central venous access, prolonged length of stay in hospital and special isolation bed requirements, which can result in problems with patient flow. While most doctors use the traditional fully-styletted technique and Quincke needles for paediatric lumbar punctures, there are alternative techniques for the procedure. Early stylet removal is one alternative, where the stylet is removed after traversing the epidermis and subcutaneous fat, allowing the clinician to visualise a CSF flashback as soon as they are in the CSF space1, 2. Atraumatic needles are an alternative option for Quincke needles, as they have a finer cutting point due to a more proximal location of the bevel. They have also been shown in adults to reduce multiple attempt rates and traumatic taps3. A multidisciplinary lumbar puncture teaching package was developed for JMOs and nursing staff working in the Emergency and General Paediatric Departments at the CHW. The teaching package was delivered in two parts, as follows. Part 1 was a 15-minute lecture delivered to large groups at the start of term. The lecture included a four-minute excerpt from an online video that demonstrates infant lumbar puncture4. The video was made in the United States and therefore contains some minor differences in practice, which were explained by the educator. Separate lectures were held for nursing and medical staff. Part 2 was a 30-minute manikin-based skills session delivered to small multidisciplinary groups during the term. The session covered patient position and hold, with demonstrations by educators and role playing by participants. Medical staff also practiced the early stylet removal technique and use of atraumatic needles. Manikins are designed so that water is drawn from the cerebrospinal space into the needle if the needle placement is correct. Incorrect placement results in bony-like resistance from the anatomically-correct manikin. Feedback on procedure technique as well as communication between medical and nursing staff was provided at the time. The initiative was implemented in Term 4 of the 2016 clinical year. A core team of senior medical trainees and nursing staff were trained to deliver the teaching package. A tutor pack was provided which included background information, a lesson plan and PowerPoint lecture slides. In addition to the teaching package, samples of 25 gauge (25G) atraumatic lumbar puncture needles were obtained and made available in procedure areas. Needle gauges bigger than 25G were not used, as they require the use of an introducer needle which makes the procedure unnecessarily complex. Traditional Quincke needles continued to be used for older infants and children requiring larger needles. Informal feedback from JMOs after using 25G atraumatic needles in PDSA Cycle 1 was mostly negative, with JMOs finding the needles flimsy and more difficult to use than traditional needles. In addition, the benefits shown in research were based on adults and weren’t realised in paediatric patients treated in the pilot project. As a result, atraumatic needles weren’t emphasised in the teaching package for PDSA Cycle 2 and removed from procedure areas in the Emergency Department. Feedback on early stylet removal was highly positive, with participants reporting increased success with this technique. As a result, it was included in the teaching package for PDSA Cycle 2. Ownership of teaching JMOs and nursing staff was handed over to department-based Fellows and clinical nurse educators, to ensure long-term sustainability of the project. Of the 17 JMOs in General Medicine (excluding relievers), 12 (71%) received Part 1 of the teaching module, 14 (82%) received Part 2 and 12 (71%) received both Part 1 and Part 2. Of the 34 JMOs in the Emergency Department, 22 (65%) received Part 1 of the teaching module, 26 (76%) received Part 2 and 20 (59%) received both Part 1 and Part 2. Of the 68 staff nurses in the General Medicine Ward, 32 (47%) received teaching. Nursing staff in the Emergency Department were included in PDSA Cycle 2. A database of all febrile infants aged three months and under who presented to the Emergency Department at baseline (October 2016) and during each month of the pilot project (November 2016, December 2016 and January 2017) was obtained from the Management Support and Analysis Unit of the CHW. Notes were reviewed to ascertain whether a lumbar puncture was attempted. Where a lumbar puncture was attempted, the outcome was recorded as either: no fluid obtained; heavily bloodstained and clotted sample; traumatic sample (where red blood cells are 1000 per mm3 or more); or atraumatic sample (where red blood cells are 1000 per mm3 or less). The project was approved (including ethics approval) by the Sydney Children’s Hospitals Network Clinical Governance Unit as Operational Improvement Activity #5395. Atraumatic rates were 64.7% in January 2017, compared to 58.3% in October 2016. Overall success rates (atraumatic and traumatic taps) were 88.2% in January 2017, compared to 75% in October 2016. It is important to remember that this was a pilot study with a small number of patients. This can affect the reliability of results. It’s important to engage consultants and nursing team leaders, so they can release JMOs and nursing staff from the floor to attend education sessions. It’s important to engage wardsmen responsible for maintaining needle stocks, so that trial needles are not inadvertently removed from treatment areas. ensured education sessions were concise and focused on key information, so participants could return to their clinical work as soon as possible. The team did not reach as many nurses as originally anticipated. As a result, new ways of engaging nursing staff are being developed. This is likely to involve better engagement with clinical nurse educators, who can advise on the content and timing of education sessions to ensure they are suitable. Baxter AL. Local anesthetic and stylet styles: factors associated with resident lumbar puncture success. Pediatrics 2006; 117(3): 876-881. Nigrovic LE, Kuppermann N, Neuman MI. 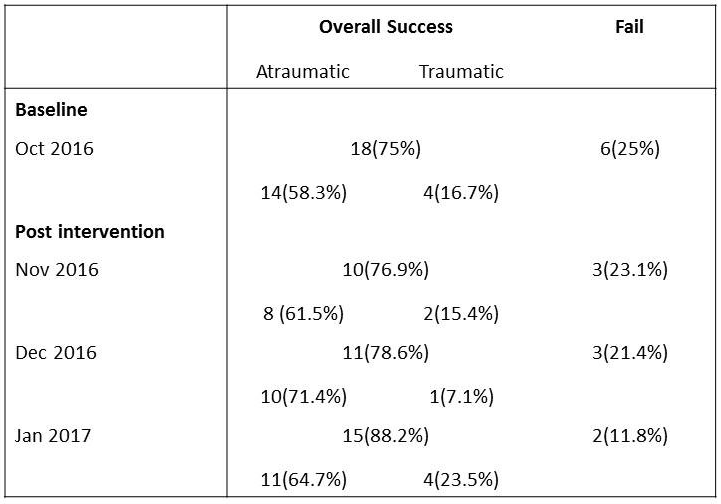 Risk factors for traumatic or unsuccessful lumbar punctures in children. Annals of Emergency Medicine 2007; 49(6): 762-771. Hammond ER, Wang Z, Bhulani N et al. Needle type and the risk of post-lumbar puncture headache in the outpatient neurology clinic. Journal of the Neurological Sciences 2011; 306(1-2): 24-28.